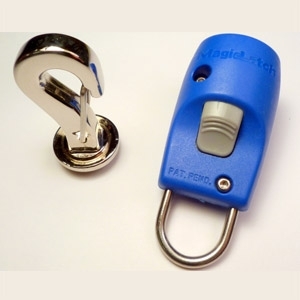 MagicLatch makes leashing a one-handed operation. Just reach down to your dog’s collar and the leash is instantly connected. Leashing is a snap with MagicLatch. The strong latches are the engineered mechanics behind the 300lb+ static weight strength, but the speed in leashing comes from tiny magnets that draw leash to collar. Available colors: Black and Blue.